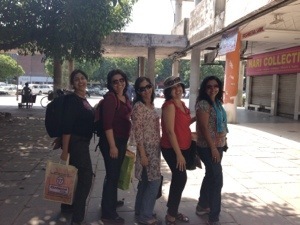 A girlie trip to the Punjab. Sounds good? It is good. Here we are, five of us. Two of whom I know, two others became my friends today. In the cool fresh air of rural Punjab, it’s hard to remember the crazy pace of city life and its easy to let go and just be. Driving on highways on a Sunday morning ensures a smooth ride and we literally zipped across Delhi and Haryana to land up in Chandigarh well ahead of schedule. Amusing sights like the gate of Jurasik Park that sported two super ugly dinosaur statues, a fiat car adorning someone’s roof in Sonepat and glimpses of two astonishingly beautiful ruined old havelis from atop the elevated highway at Gharaunda were some highlights. Prompted by these and other sights, the conversation flowed. From homes and husbands and children to hobbies, vacations and the dubious joys of social networking. Silly jokes, nostalgic anecdotes from the past. All poured out of us as we bonded. As women are wont to. And then we reached Chandigarh and got off the car in the infamous Sector 17. Where you apparently go to hang out, ogle at the girls or guys depending on your choice and simply pass time. We girls, on the other hand, were dead serious about our shopping. Or at least two of us were, buying up the place in record time and derailing the time schedule by an hour! Going back to Chandigarh after years was a pleasant experience though. What a vision Corbusier had in terms of scale for public spaces! I can imagine hundreds of people thronging the square in Sector 17 and it would look right. The tree lined parking, the street furniture, lovely shaded corridors and a large open space make for very nice high street retail indeed. Unfortunately on a Sunday morning and most other times this city does not create the sort of mass that a space like this deserves. Swank showrooms aside, there is a laid back run down quality to this place as well. 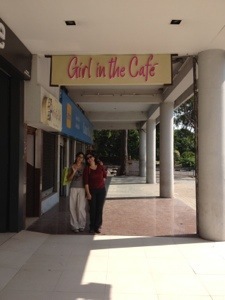 Of course, that didn’t deter us from shopping, eating and giggling like schoolgirls. Some of whom we encountered in the ladies loo of ‘Girl in the Cafe’, attending to a puking friend who hadn’t been able to hold down her morning vodka! A short drive from here and we were in the lovely fort of Bharatgarh, the last living fort in the Punjab and the seat of one of the twelve Misl of Sikh warriors. We headed out almost immediately and are just back from soaking in the mesmerising experience of the Khalsa Museum at Anandpur Saheb. But I will wax eloquent about the fort and the museum another day when I can upload the pictures that will show you their surprising beauty. For now, it’s goodnight amid chit chat and more giggling. 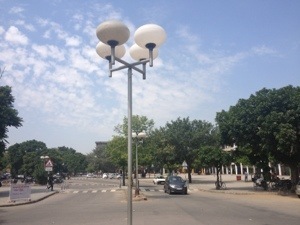 Posted on September 30, 2012, in Travel & Experiences and tagged Chandigarh, public spaces, Punjab. Bookmark the permalink. 1 Comment. Sector 17 brings back memories – but you were lucky to be there on a Sunday. On most evenings, it is packed! Way back in the 70s, it did seem that the dimensions were out of sync with the population.